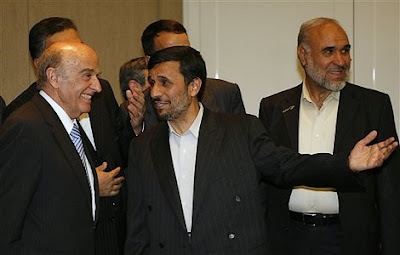 That's Swiss president Hans-Rudolf Merz with Iranian president Mahmoud Ahmadinejad. Ahmadinejad is here to speak at the Durban Review Conference, which also starts today. He met privately with Merz yesterday. Oh, by the way, did I mention that Ahmadinejad is an outspoken Holocaust denier? Sometimes you just don't know whether to laugh or cry.